In case you weren’t aware (and I certainly wasn’t), the Douro Valley where port wine is produced was the first officially demarcated viticultural areas in the world in 1756, although Chianti and Tokaji were regionally defined but not regulated before this. The actual viticulture and initial fermentation is no different to any other red wine, but the fruit can tend to be a little riper with more natural sugar in it. 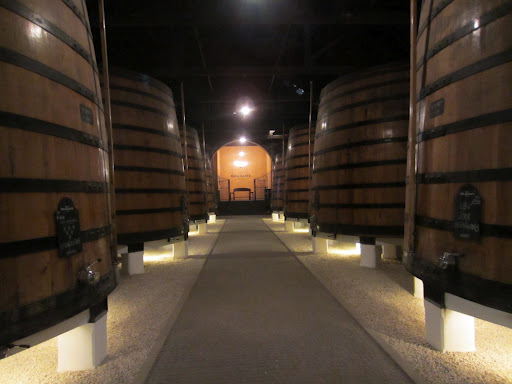 After the fortification the wine used to travel down the river on boats in barrels, but today the wine travels on the road in climate controlled tanks. 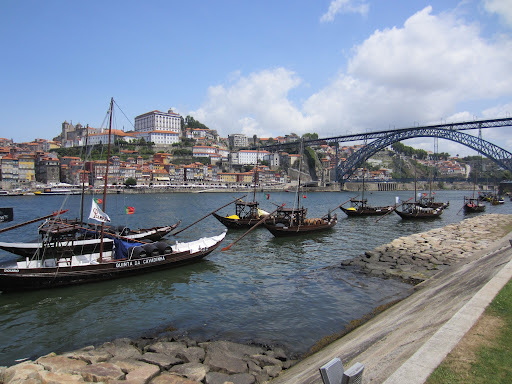 When you visit Vila Nova de Gaia on the left bank of the Douro in Porto, you can still see the barcos rabelos moored and floating, and now they are only used for racing and tourism. British merchants were permitted to import port at a low duty in 1703 which led to the wine gaining much popularity, partly because the war with France deprived English wine drinkers of French wine. 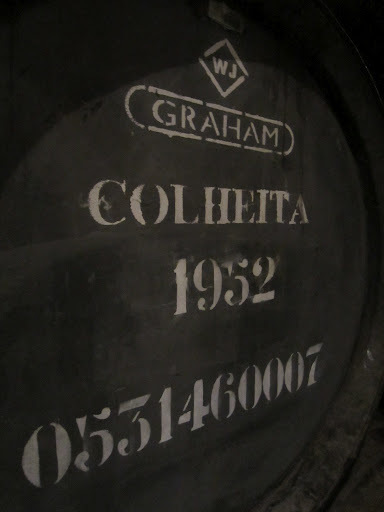 The English involvement in the port trade grew much like in sherry, and still remains today in the names of many port shippers such as Cockburn, Croft, Gould, Osborne, Offley, Sandeman, Taylor, Graham, Dow and Warre, the last three of which are owned by the same family and I had the chance to taste on my second day in Porto. Porto is not a particularly beautiful city, looking slightly tired and suiting the functional nature of it’s history as a shipping port. In spite of this it is not only a relatively vibrant city but also somewhat of a tourist hotspot for a few reasons. One of the big draw-cards is of course the port houses that are not only historically important to the city where visitors can learn a bit about them, but they can also taste some lovely sweet wines that are so unique to this place. I was told that one house in a perfect location receives around 300,000 visitors per year, which is three times more than the winery that I used to work for, one of the most visited wineries in Australia. It helps that like Jerez, Porto receives a lot of cruise liners and guests come ashore to visit one or two houses to taste. Ramos Pinto offers tours every twenty minutes in four languages, and they would offer more if they could find staff who could speak them. This does makes the banks of Villa Nova de Gaia very touristy with people hawking river cruises, tuk-tuk tours and any number of nick-nacks, paddy-whacks and give-a-dog-a-bones. That is why it is nicer to visit one of the houses away from the river up on the hill, like Taylor’s, Croft or Graham’s. As I mentioned Graham’s is part of a group owned by the Symington family, along with Warre’s, Dow’s, Quinta de Vesuvio and the recently purchased Cockburn’s. The first three of course have a British heritage, with the establishment of the houses occurring between 1670 and 1820. As I mentioned in the previous post, the really important thing to define and separate each port house is their vineyards in the Douro, as this generally determines the quality and the style of the wine, and even when a vintage is good enough to declare a vintage port. The group owns 1,000 hectares of vineyards across the five brands, making them the largest single owner of vineyards in the Douro Valley. Like every big house they purchase additional fruit or wine as necessary to go into much of their entry-level ruby and tawny ports, but the fruit for the top wines always comes from their own vineyards which they meticulously care for. Each house has its own unique personality, but Graham’s is generally considered the jewel. Vintage ports at Graham’s are rarely released, and you can see this in the visitor centre with one bottle of each going all the way back to 1870. To commemorate the 60th jubilee of Queen Elizabeth II they released a vintage tawny (colheita) from the year of her inauguration in 1952, something that very few houses could do. The approach to quality stretches not only to the other port houses, but also to the range of still wines they have been developing but I didn’t have the chance to taste. I got to try a selection of the Graham’s (read the notes here), and Warre’s ports (read the notes here). Click here to see more photos from my second day in Oporto, Portugal. The following week I travel up the river to see where the fruit is actually grown.